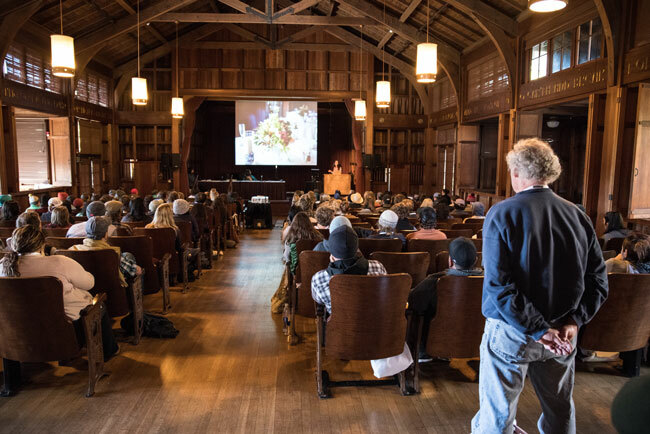 Joanna Letz of Bluma Farm and Courtney Mellblom of Farmermaid Flowers shared their experience growing and selling flowers with a large audience in the “Organic Flower Production” workshop at EcoFarm 2018. The two women discussed imperative aspects of running a flower farm including financial record keeping, marketing and sales outlets, and the unique challenges and opportunities facing flower growers. Flowers are a unique crop and although they mean more money per acre than food crops, they are very intensive, require more effort to grow, and are often ready to harvest at the same time. Joanna recommended that growers aim to harvest flowers all throughout the year, not just during the busiest growing months. By growing varieties that can be harvested during the off-season, the large amount of work that comes with harvesting up to 50 flower varieties during the summer can be distributed over the whole year, and selling flowers during the off-season can fetch a better price. “If you can have flowers for Valentines Day and Mother's Day, then you’re really doing something great. That’s when you want to be selling flowers,” Joanna explained. She’s working on making this a reality on her farm. Courtney presented several creative ideas for selling flowers all year long. She grows perennial varieties along with native plants and grasses that she sells directly to florists. Because she’s a one-woman operation, she doesn’t have a lot of time to be constantly turning beds. For this reason, she doesn’t grow a huge amount of “one-hit wonders,” or annual flowers that can only be harvested once. She also grows dryable flowers that she can sell in the winter when there’s not much else to sell, and she can get a great price on the wreaths she makes from willow, bay laurel, and pepper berries that grow along the highway. Both Joanna and Courtney farm on a small amount of land, and to utilize space, it’s imperative to know which flowers will sell and be worth the work put into them. Joanna plans to narrow down which flowers make her the most money and cut down the amount of varieties she grows. Right now, she plants an average of 50 varieties, with each variety making about 1-2% of sales. Courtney farms on land that belongs to another farmer. She started her farm as a side project with a very low overhead and has been able to grow her business in a healthy way. She sells mostly to florists, small grocery stores and her bouquet subscription program, as well as through third-party CSAs, weddings and non-profit events, workshops and craft fairs. Growing flowers has allowed Courtney to keep her operation small in a way that growing vegetables could not. The most important advice Joanna wanted the audience to take away from her presentation is to keep records of all aspects of a business, including sales, customers, varieties, harvest schedules, and costs. This is the easiest way to figure out which practices are making the most money, which are not making enough money, and how a business owner can continue to grow and succeed in the flower industry. During Joanna’s third year in business, she hired a friend as a bookkeeper and began keeping records of her sales which she says was extremely helpful. Thanks to her sales records, Joanna has been able to figure out which outlets make her the most money, which involve the most labor, and what she should prioritize or phase out. Visit EcoFarm's online shop to hear this workshop audio recording.